Out of SuperBite’s ashes comes Bistro Agnes. Chefs Gabi and Greg Denton have known great success in the Portland restaurant business. They're also familiar with failure. After years burnishing their rising-star credentials, the couple seemed invincible. First, they turned the humble wine bar Metrovino into a destination. Then they opened Ox, the stellar Argentine-Northwest grill that is still on every best-of-Portland list. But the Dentons' follow-up effort, SuperBite, closed after a lackluster 20-month run, despite its prime downtown location. To me, its biggest failing was that it wasn't Ox. Out of SuperBite's ashes comes Bistro Agnes. And while it may not match the multidimensional transcendence of Ox, this bright and expertly operated French-casual dining room takes a long stride toward the form that earned the Dentons a James Beard Award in 2017. From the serious diner's perspective, Agnes is at its best with the rich, no-holds-barred French dishes that dot the menu. Among the starters, the modest-sized pig's head croquette ($10) packs a powerful punch, with meaty, chewy porcine cranial pluckings cubed in just-thick-enough breading and deep-fried to a crunchy umber. The decadence of the dish is underscored with its base of sauce gribiche, the classic mustard-kissed cousin to tartar sauce. A generous plate of warm asparagus ($16), each spear fastidiously shaved, appears in a pool of eggy, buttery bearnaise sauce and topped with quick-sautéed morel mushrooms and a scattering of fresh tarragon leaves. Among entrees, the beef shortrib bourguignon ($29) is deep, dark and delectable in its cloak of red wine- and beef broth-based sauce. The meat itself is juicy and practically spoon-tender, and it gets fist bumps from its roasted mushroom, cubed bacon and chopped onion plate mates. An accompaniment of buttered noodles gild the lily in an endearing way. The cassoulet ($34) has enough duck confit, pork belly, toulouse sausage and white beans to work as an entree for two. The lightly sauced, not too fishy sole meuniere ($25) is perfect for fish lovers. 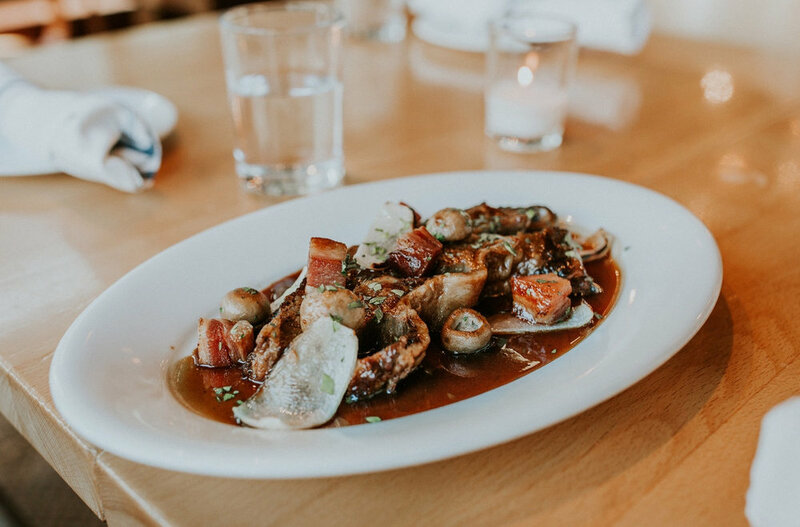 And please, pay attention to the nightly specials: Monday's sautéed veal sweetbreads with madeira in puff pastry ($28) and Wednesday's duck breast a l'orange ($28), both generously portioned, were highlights. Lunch is hardly a step down. Standouts are the croque monsieur ($11), a steroidal ham-and-swiss sandwich on toasted brioche topped with cheesy mornay sauce, and its egg-topped soulmate, the croque madame ($13). Dessert is a delight, too. The profiteroles ($8) are a French tradition done right—spheres of pate a choux pastry clamshelled around mini-scoops of vanilla ice cream and topped with a drizzle of bittersweet chocolate sauce. Seared foie gras with pain perdu and maple-roasted rhubarb ($24) is an alluring alternative, despite what your cardiologist might say. If you have friends or family for whom "rich" or even "French" are dirty words, the Dentons have you covered. Look for the simple butter lettuce salad ($9), side dishes of sautéeed spinach ($7) or watercress ($5), a cheeseburger (ignore the "a la Francaise"; $16) and a 12-ounce rib eye with fries (aka "steak frites," $38). A refreshing scoop or two of sorbet ($8) should suffice for a lighter finish. The Bistro Agnes space—going back to its days as alpine specialist Grüner—has its awkward jags, including a nearly nonexistent entryway, a path to the restroom that runs dangerously close to where hot dishes are handed off from kitchen to servers and a small, tight bar area. But the banquettes are cushy, the tables spaced just right, and the French soundtrack is calibrated to swing. The failure of SuperBite had to be ego-bruising for the Dentons' perfectionist streak. But clearly, it served as a powerful motivator for their next effort. Agnes places them firmly back in the winner circle. GO: Bistro Agnes, 527 SW 12th Ave., 503-222-0979, bistroagnes.com. 11 am-2 pm daily, 5-10 pm Sunday-Thursday, 5-11 pm Friday-Saturday.